Pure Kornax MSM Crystals – 2 lb for $19.95! MethylSulfonylMethane from Rich Distributing is a Nutritional Organic Sulfur that keeps skin, hair, and nails healthy, and it has been referred to as Nature’s “Beauty Mineral.” MethylSulfonylMethane is a nutrient, a normal metabolite of dimethylsulfoxide, better known as DMSO. Rich’s MSM Supplements are derived from wild conifers and contain 100% pure, organic MethylSulfonylMethane without any binders or fillers. Rich’s MSM Supplements are no more toxic than water. Any excess MethylSulfonylMethane in your system will stay in the blood stream for 12 hours removing toxins and cleaning the interior walls of arteries. Food refining and processing removes MethylSulfonylMethane much the way they reduce Vitamins and Minerals. MethylSulfonylMethane helps our bodies utilize the vitamins that we take, thereby providing the means to derive the maximum benefits from them. 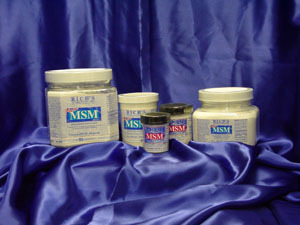 The M.S.M from Rich Distributing is known to be the purest, safest brand of MethylSulfonylMethane on the market. Rich’s MSM Supplements contain a natural form of organic sulfur found in all living organisms, which is present in low concentrations in our body fluids and tissues. It is a natural component of many fresh fruits, vegetables, seafood and meat. However, unless your diet is composed primarily of raw foods, it is unlikely that you are receiving enough MethylSulfonylMethane for proper health management. A single dose of MethylSulfonylMethane is usually not effective in ameliorating symptoms. Noticeable results are usually seen within 2-21 days. When taking Rich’s MSM Supplements, it is suggested that Vitamin C be taken also. MethylSulfonylMethane needs the Vitamin C to help it build healthy cells. We have two forms of 100% Natural Vitamin C Supplements available from Kornax at a discount. * Kornax Enterprises and Rich Distributing are entirely separate and independent companies. Kornax Enterprises is a discount retail business, selling the Rich Distributing products. **The Food and Drug Administration (FDA) has not evaluated this statement. This product is not intended to diagnose, cure or prevent any disease. Rich Distributing is in no way responsible or obligated to verify the statements made on Kornax Enterprises, L.L.C.